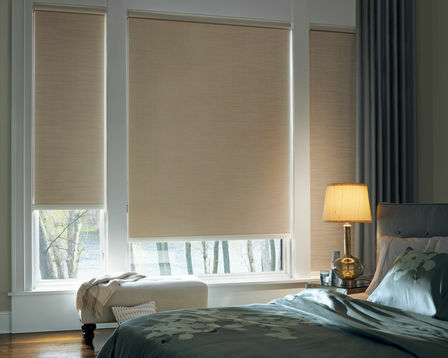 Designer Roller Shades offer a clean, classic look that will work in any room in the home. They combine the ease and simplicity of a roller shade with an impressive range of sturdy and distinctly beautiful fabrics-from sheer to opaque, patterns to textures as well as traditional solid colors. In addition, the sleek, custom clutch operating system that features precision-tuned lift technology resulting in exceptionally smooth operation. Enjoy the convenience of our battery operated or hard-wired control systems doing the work of raising, lowering, traversing or tilting your roller shades for you. Providing the ultimate in window treatment control, our motorized systems allow you to operate your shades individually or in groups, by remote or programming. Simple and cord free, our motorization options are aesthetically pleasing and safer for children and pets.